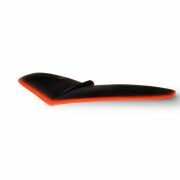 The Futura Foil is modeled around Slingshot?s industry leading Hover Glide foil platform. It?s a medium lift, medium speed design, ideal for paddling in on waist high waves. The Futura foil excels at down-the-line, bottom to top waves, or any bump with real structure. It features flat, medium-lift, front and rear wing stabilizers. Designed for early takeoff and relatively fast foiling speeds. Quick and responsive turning once you?re up and riding. Fast top-end speeds are important to progress through the beginner stage. The Futura?s 24-inch mast length is just right for surfing. It has plenty of vertical to tap into the energy of a wave, making it optimal for carving. And, short enough to reduce the severity of crashes and prevent you from running aground.